On Thursday, June 15 the Lethbridge Police Service and Lethbridge Elder Abuse Response Network (LEARN) will be hosting a community event to recognize World Elder Abuse Awareness Day. Since 2006, organizations around the world have held events to raise awareness of elder abuse as a health and human rights issue. Elder abuse is any action or inaction by a person(s) in a trusting relationship that causes harm and distress to an older adult. Categories include physical, emotional, financial, sexual, medication and neglect. Abusers can include family, friends or people who provide support. Some common signs that could be elder abuse include a sudden change in financial situations, unpaid bills, isolation or withdrawal from normal activities, bruising, a decline in health, poor hygiene or depression. Social isolation is a significant factor in elder abuse and older adults are at greater risk of becoming socially isolated. Staying active, connecting with others, learning about rights and accessing community support are all ways to reduce the risk of abuse. Approximately 7.5 percent of older adults experience abuse. 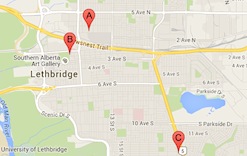 There is a strong network of support available through the Lethbridge Elder Abuse Response Network. Older adults who are mistreated can receive assistance through experienced staff. LEARN also provides educational presentations to increase understanding of elder abuse and the resources available in the community. Community members can assist by reporting their concerns to the LEARN Coordinator at 403-394-0306. Anonymous referrals are accepted. 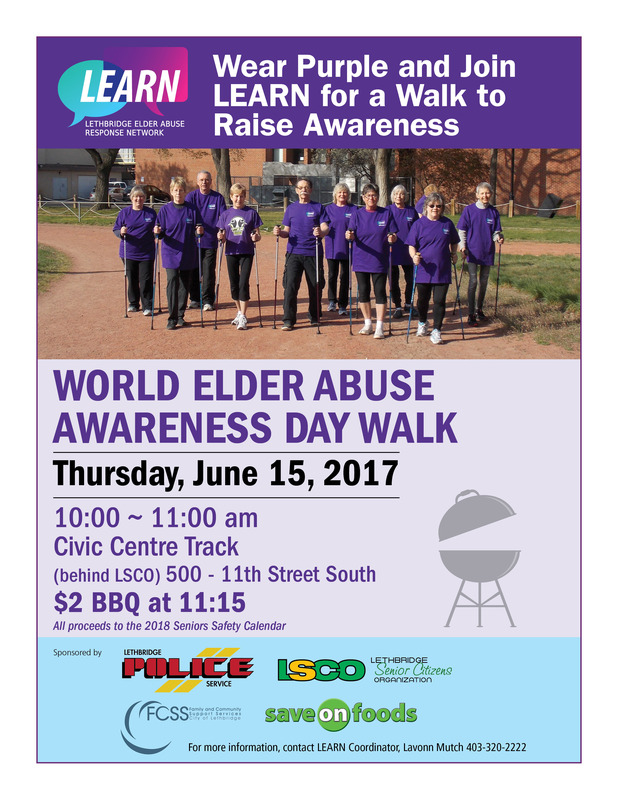 LEARN partners will be hosting an awareness walk and community BBQ June 15 from 10 a.m. to 1 p.m. at the Civic Centre Track behind the Lethbridge Senior Citizens Organization. Hot dogs, chips, and pop will be sold for $2.00. All proceeds to assist with funding the annual Lethbridge Seniors Safety Calendar. Purple is the official colour of World Elder Abuse Awareness Day. City Hall will be purple to recognize this international day. You can show support by attending the event, wearing purple on June 15, watching for signs of abuse in the older adults around you and by helping people to connect with community resources when in need of support.